Ultraviolet radiation (UVR) is the part of sunlight that causes skin damage and can lead to the development of skin cancer. UVR is not related to light or temperature, so you can't see or feel it. It can be reflected by light and shiny surfaces such as sand, snow, concrete and water, and is present on cloudy days - heavy cloud does decrease UVR but scattered cloud has little or no effect on UVR levels. UVC does not reach the earth’s surface but can be produced artificially (eg. welding equipment). The ultraviolet (UV) index provides a consistent and international measure of the sun's ultraviolet strength. It measures UVR on a scale of 1 to 11 and beyond. The higher the number, the stronger the radiation and the faster your skin will burn. 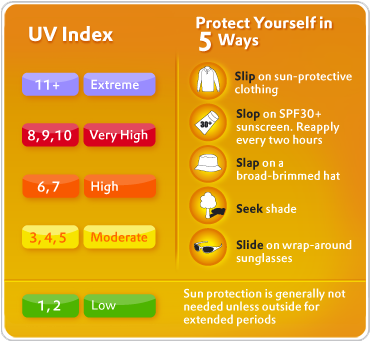 You are at risk of skin damage when the UV Index is 3 or above. Check the predicted UV in your area. 0-2 = Low Category. No protection required, except if you have very fair skin. Use sunglasses and sunscreen. 8-10 = Very High Category. Protect yourself in 5 ways and try to reschedule your outside activities outside peak UV times. 11+ = Extreme Category. Protect yourself in 5 ways and try to reschedule your outside activities outside peak UV times.